This strange, wonderful little series remains a personal favorite on the current comics shelves, not just for the twisted nature of the premise, backed up by Scottie Young’s unique artistic talent, but also for the escape of it all. Issue #14 brings us readers back to this the present after a filler flashback of Gert’s tiny floating companion. The journey continues, with Gert somewhat feeling troubled on her progress. Which brings about the question…has anything been gained for her on this journey through these strange lands. Has she really learned much at all, as a person that has trouble growing physically? No, not really. Gert is back on another quest of sorts on her fluffed-up journey. And just when you thought every fantasy parody has been poked and stirred, there comes a ….labyrinth. And wow, here we go. 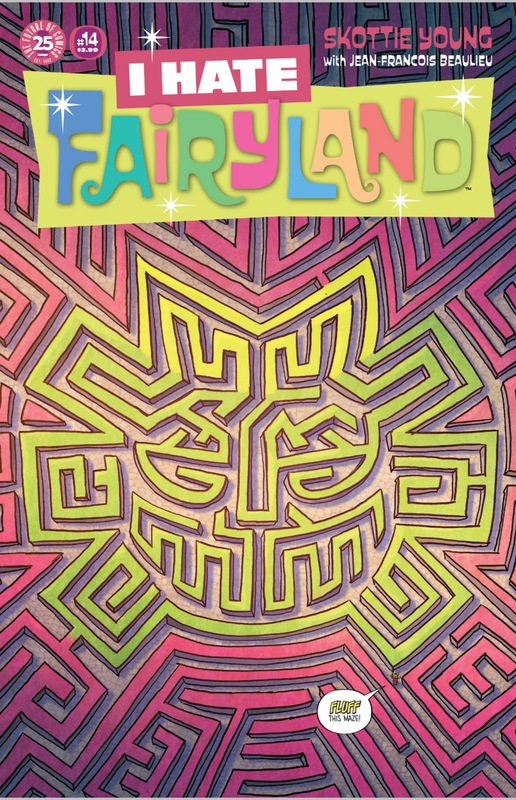 we meet a host to a large maze that shall be the next challenge for Gert. And, he is an obvious parody of David Bowie’s character from the movie Labyrinth; but exposing himself in a much more disturbing way. He also has an obsession with balls and marriage. Neither goes well for Gert. What follows is the usual fairyland silliness. Such is fun if you allow it, and there are smiling bits through various parts. Once again Scottie Young lets his style hang loose with all sorts of wacky, bizarre characters; and keeping Fairyland consistent as a colorful, sugar coated hellhole . On a side note put pondered, I think an I Hate Fairyland tabletop board game would be awesome. Skottie young, make it happen!